For the past several years Erik and I have brought pie to Thanksgiving dinner. Our second year of marriage Erik asked my mom if we could bring pie and spent hours trying out different crust recipes. Every year since we have been in charge. Since Erik is the pie maker I wanted to add something to the pies this year. We had our practice run this week to make sure they were perfect for Thanksgiving and I had fun playing around with the crust design. 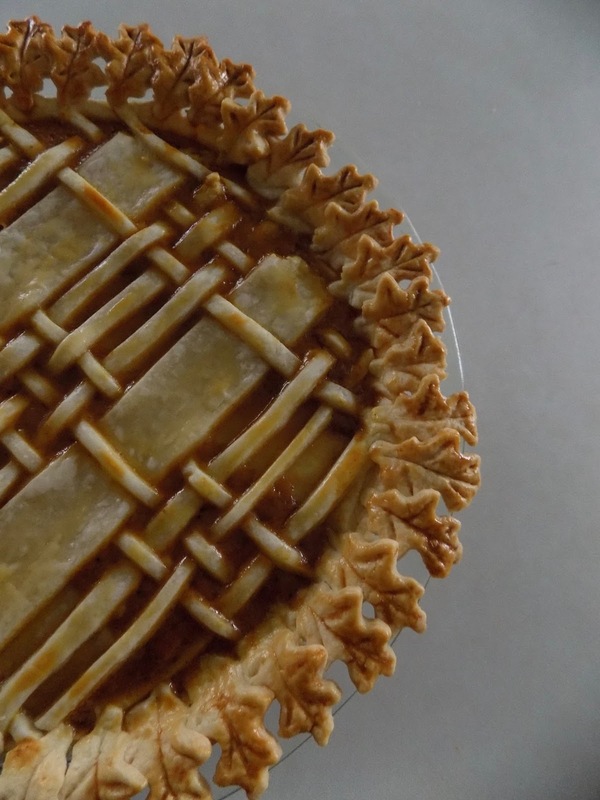 We decided to use leaves as a border around the pie and added a lattice design on top. We used this cookie cutter set for the small leaves. After they were cut out we used a kabob stick to create the design on top and placed them around the edges. Then we used a pizza slicer and cut out large and skinny lines of dough and weaved it on top of the pie. Make sure to use an egg wash on top so the dough doesn't burn. I think it turned out so well! We will be making a couple of pies for Thanksgiving next week and will be doing a different design on each of them. You can find so many designs and ideas on Pinterest. What are you bringing to Thanksgiving dinner?